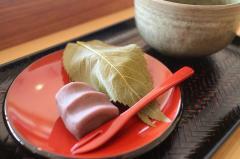 With some 100 years of history, this café is directly run by "Kotokiki-Chaya", a teahouse renowned for sakura mocha. The café is located on the north side of the Togetsukyo Bridge in a charming location with a view of the Oigawa River and Arashiyama. For that reason, the ground floor is maintained as just a counter-style café providing windows of the changing seasons. There is plenty of room on this floor for wheelchairs to move comfortably. On the menu here, visitors will find two types of sakura mocha, hon-warabi mocha (bracken-starch dumplings) and green-tea parfait as well as set meals, like pasta dishes and hamburger lunches. This café is a great place to visit for lunch or morning/afternoon tea. City Bus "Arashiyama" or 1-min walk from Randen "Arashiyama" Stn, or 7-min walk from Hankyu Arashiyama Line and JR Sagano Line "Saga Arashiyama Stn"
The most popular dish in the café is the Hanashirube set (864 yen), comprising three dumpling cakes: the famed sakura mocha (Domyoji mocha wrapped in two sakura leaves), the hon-warabi mocha and Kuzu mochi (kudzu starch). Here the sakura mochi offers the delightful aroma and flavor of cherry blossoms while the hon-warabi mocha offers a firm but delicious dumpling. Another set to enjoy is the one that offers two types of sakura-wrapped Domyoji mocha, one without bean jam (an) and the other with. This set (648 yen) comes with macha green tea, and is highly recommended. There are no steps between the road and entering the ground. But best to use the handrail and slope to bypass the steps at the entrance. The width is 80 centimeters and the length only 2.5 meters, but the slope is very steep. The entrance has double opening automatic doors (176 cm wide). The walkway near the entrance is 3 meters wide, so spacious and easy to move in. To the right of the entrance on the inside is a set of six steps leading to tabling on second floor. Head to left to reach a 22-seat counter. The walkway is 130 centimeters wide and floor is flat on first floor. Go straight ahead for the toilets. Tables have 68 centimeters of space under them. Counter seating close to the entrance is recommended. For the toilets, head straight from the entrance, and turn right to reach gender-specific toilets. On the men&apos;s side, there is a urinal and a single western style toilet with a slide-door entrance (68 cm wide). On the women&apos;s side, the entrance is pull-type door (68 cm wide) and there are two western-style toilet cubicles, with basins. For wheelchair users and people with babies there is a unisex universal toilet just before the other toilets. This toilet has a wooden slide door (71 cm wide), basin, baby bed, handrails and bidet. Café is on north side near Oigawa River and Togetsukyo Bridge. Please use the slope to make your way into entrance. The ever popular three-piece cake set "Hanashirube"
The restaurants and bars introduced here have all shown eager support for the outlook of this homepage – however, they are not strictly validated as barrier free premises. In fact, some of them do not even have barrier free facilities, but if a wheelchair user is accompanied by someone, the premises in question also will make an effort to help, in order for any guests to enjoy a meal or a drink, which is why we introduce such premises here. Nevertheless, we do recommend that you contact any premise you wish to go to in advance.